A Complete Miser’s Dream Kit! INCLUDES ALL METAL BUCKET, CHROMED JUMBO COIN, COIN HOLDER, AND DVD OF LIVE PERFORMANCES AND DVD INSTRUCTIONS! Pulling coins out of kid’s ear is a classic that’s expected from every magician. The perfect routine for family and kid shows! A trick that packs small but plays big! It can be SEEN and HEARD for maximum impact in the largest venue! Tons of laughs with Robert’s easy to do magic routine! Over 5 minutes of fun! EVERYTHING YOU NEED TO DO THIS AUDIENCE PLEASER! A kid is chosen from the crowd. The magician pulls coins from the children’s ears and from out of the air. Tons and tons of laughs as the magician milks the kid of coins! An extremely easy to do magic trick so you can really focus on the laughs! Robert has taken this staple of the magicians’ repertoires and simplified it to produce a SUPER STRONG routine! 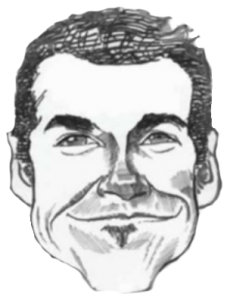 Becomedyst of all, Robert has eliminated the difficult sleight of hand and included lots of jokes, gags, and bits for extra fun! You’re getting a full comedy routine with all sorts of funny bits, jokes, gags, and lines straight out of Robert’s act! DVD length: 60 mins. A full hour of instruction! Hey, metal buckets and chrome jumbo coins are heavy! 🙂 DVD ALONE ALSO AVAILABLE! ONLY $18.74 WITH FREE SHIPPING!!! Use your own bucket and coins PLUS GET A FREE BONUS NOT AVAILABLE FROM ANY OTHER DEALER: A SAMPLE PALMING COIN/ WASHER AS DEMONSTRATED ON THE DVD! BONUS LIMITED TIME OFFER: INCLUDES FREE! shipping and handling inside the United States! Outside the United States $103.80 with Airmail Priority Shipping. AVAILABILITY IS LIMITED. DON’T DELAY! WHEN THEY’RE GONE, THEY’RE GONE! 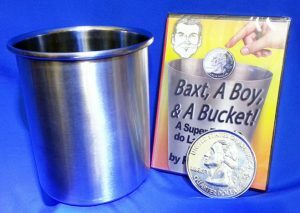 Rave Reviews For Baxt, A Boy, & A Bucket! OUTSIDE THE U.S., You can have the DVD alone for the same price, WITH SHIPPING INCLUDED, BUT! No packaging. YOU DO GET THE PALMING COIN/WASHER! You can buy the DVD alone for $18.74, or you could buy a full kit for $69.95!! Both options include free shipping in the United States. Outside the United States, the DVD alone price is the same, $18.74 but it comes with no packaging and is shipped flat. A CLASSIC BAXT TOP SELLER! PLUS!! order select other items from this site to get combined shipping for greater savings! Email robert@robertbaxt.com with your complete order for shipping charges.